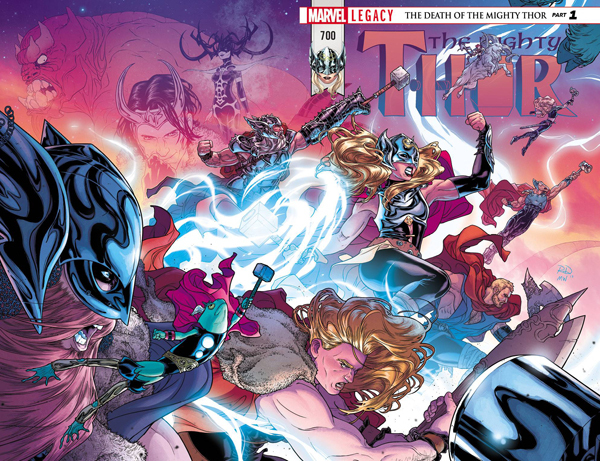 DEATH OF THE MIGHTY THOR Part 1! The final judgement comes as the Mangog arrives! The War Thor will meet the beast head on. But even the bloodthirst of this Ultimate Thor may pale in comparison to the might of the Mangog! The battle rages as Jane's cancer takes a turn for the worse, and she might not have to wait for the final judgment at all. The clock is ticking, and no hammer can save her this time. It's the beginning of the end that will lead to the most dramatic return in the Marvel Universe! PLUS: Includes 3 bonus Marvel PRIMER PAGES! Story by Robbie Thompson and a TBA artist! FINAL COVER MAY VARY. ALLOCATIONS MAY OCCUR. MIGHTY THOR #700 LENTICULAR HOMAGE VARIANT CGC GRADED! MIGHTY THOR #1 SIGNED BY MATT FRACTION & REMARKED WITH A MJOLNIR SKETCH BY KEN HAESER!